Tired of waking up to whatever heart-attack-inducing alarm is working for you this month? 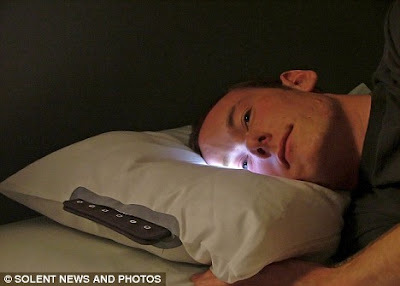 A student design team from Dublin may have found a calmer, but more effective way to wrest you from the covers; their pillow alarm clock is rigged with LED lights that gradually brighten over a forty minute period, simulating a sunrise and letting your circadian rhythms adjust more naturally to a waking state. A layer of special material makes for a feeling indistinguishable from a normal pillow and even doubles as a reading light. Brits can look for it in stores by the end of the year, but no telling when it will hit North American shores.